If you haven’t picked up on it, I am obsessed with the NutraMilk. It is the easiest way to make alternative milks and butters in minutes. I use it to make all of my nut milk, oat milk, nut butter, dips and spreads, etc. My friends often reap the benefits and they definitely are this holiday! 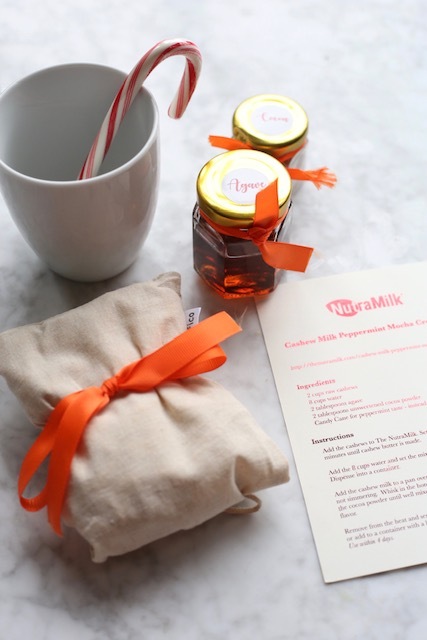 The NutraMilk team sent the cutest holiday gift with the recipe and ingredients to make Cashew Milk Peppermint Mocha Creamer. This came just in time to whip up a batch and give as presents. I am sharing the recipe with you so you can spread the love! *Or 8 cups pre-made cashew milk if you aren’t set up for making your own. SKIP STEPS 1 & 2 if using pre-made cashew milk. Add the cashews to the NutraMilk. Set the butter cycle tor 5-6 minutes until cashew butter is made. Add the 8 cups water and set the mix cycle for 3 minutes. Dispense into a container. Add the cashew milk to a pan over medium-low heat until warm, not simmering. Whisk in the agave and cocoa powder until incorporated, then whisk in the candy cane until fully dissolved. Remove from heat and serve immediately in your hot coffee, or add to a container with a lid and refrigerate until ready to use. (Use within 4 days).